Yorkshire side The Fox FC have fought off competitors from around the country to win a life-changing ‘Premier makeover’ worth £20,000. The club, whose website is powered by Club Website, entered the competition after club chairman Lee Quickmire read about the competition via his website admin area. Now The Fox, who play in the York Minster Engineering League, are all set for £20,000 ‘Premier makeover’ provided by Glidden Trade in association with The News of the World. The Fox FC’s players will live like Premier League superstars for an entire season, with a makeover for the team’s clubhouse, a new kit and kit washing service, executive travel to and from away matches and a training session with a leading football coach. Even The Fox ‘WAGs’ won’t miss out on the action; they’ll be getting pampered with beauty treatments and a shopping experience before a VIP night out at a London club. Having heard about the News of the World competition via his club website, striker Lee submitted his goal celebration from a charity match against a York City Old Boys XI earlier this year, where he opted for the traditional, but much-loved, ‘shirt over head’ celebration before immediately 'retiring’ from the match in spectacular fashion. The celebration - which can be viewed here (about 5:55 in) - was a reprise of a light-hearted moment from a previous game where Lee had mimicked an opposition player "getting a bit over-excited" in his celebration. "It was first game of the season, so there's not much riding on it, and one of their guys scored and ripped his shirt off," Lee told Club Website. "He was ripped but we all thought it was a bit of a daft celebration so, when I scored with the last kick of the game, I thought I'd do the same as a mickey take... whereas I'm a bit more rotund!" "I used to get a bit of grief about me weight. Not any more. They're now telling me to eat more pies!" The prize is a fitting reward for the New Earswick club who were set up in 2009 to support Marie Curie Cancer Care. The club recently presented the charity with a cheque for £2,800 from their very first season, but now it's The Fox's turn to be on the receiving end. This weekend will see the team play in their brand new kit and transported in their luxury bus for the first time, something which Lee finds "hilarious". According to Lee, the makeover has provided a huge boost to everyone at the club and is "massive for the players and wives, but it’s also a boost for the work we do for Marie Curie Cancer Care." As well as charity matches, previous fundraising exercises have included race nights, quiz nights, pig racing and sales of a club calendar and a prize draw for Take That concert tickets (see below). There's obviously some fantastic work going on at The Fox FC and this 'Premier makeover' is throughly deserved. So well done to Lee and all the lads from everyone at Club Website - enjoy the prize! 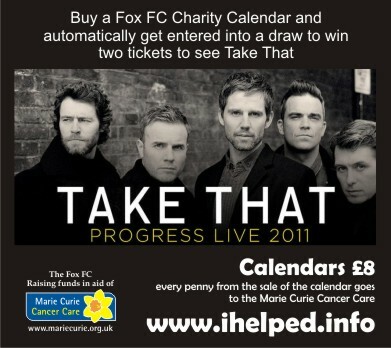 Win a pair of Take That tickets and support Marie Curie Cancer Care! Would you like to win a pair of tickets to see Take That in Manchester and help The Fox FC raise even more funds for Marie Curie Cancer Care while you're at it? The club have a pair of tickets to see Take That performing at the City of Manchester Stadium on 10 June 2011. With Robbie Williams back in the fold these tickets are like gold dust, but the club are giving them away to one lucky person who purchases their charity 2011 calendar via www.ihelped.info before 31 December 2010. Anyone making a purchase will be automatically entered into a prize draw to win the tickets and every penny made from the sale of the calendar will be going to Marie Curie Cancer Care. Lee said: "My hope is this will generate quite a few sales, which in turn will raise thousands for charity . The only people to benefit for the Take That tickets are the Charity and the person who was kind enough to buy a calendar. "Doing the calendar raised over £1,000 last year and we gave Marie Curie a cheque for £2,800 in total. This year I want to absolutely smash that!" 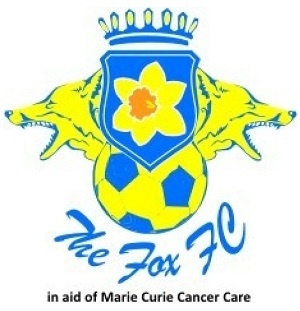 To find out more about The Fox FC, visit their club website at www.foxfc.co.uk. “Winning the prize is massive for the players and wives, but it’s also a boost for the work we do for Marie Curie Cancer Care."